When the large-scale housing estate Grigny la Grande Borne was built between 1967 and 1971 in the southern banlieue of Paris, many experts considered it to be a successful alternative to the majority of France’s grands ensembles, in part due to the gently curved geometry of its plan. According to the rhetoric of the responsible architect Émile Aillaud, La Grande Borne was regarded as a “ville,” a multi-faceted “town,” contrasting with the large scale and monotony of French postwar housing. 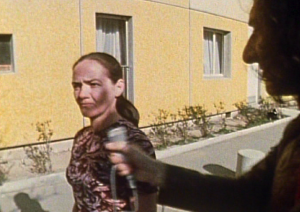 In 1973, against the background of a reorientation of the country’s spatial planning and housing policy, the journalist Jacques Frémontier and the filmmaker Bernard Gesbert challenged Aillaud’s discourse on the urban character of his “town.” In their television documentary Grigny la Grande Borne ou L’enfer du décor they revealed his lack of understanding and disregard for the living conditions of its residents. Hélène Jannière examines this turning point in the media debate over Grigny. The film is emblematic of the changes in architectural criticism in the 1970s and reflects the larger trend from an aesthetic criticism of architectural and urban planning concepts toward a social criticism of the modes of living and internalized power relations.